This last weekend the OH and I travelled down to London to attend a Great British Beer Festival meeting in Fuller's Brewery, Chiswick. As it is such a long journey we usually stay overnight in London, but due to the clash of dates with the London Marathon the nearest affordable accommodation we could find was in Borehamwood. The cost of the room for two nights, parking and train fares to and from London were less than the cheapest room we could find in the centre of London! Unfortunately it did make for a very long day on Saturday, made worse by both of us falling asleep on the Piccadilly Line from Hammersmith and ending up somewhere called Turnpike Lane instead of getting off at St Pancras! Oops! As a result I am very, very tired - I managed the household stuff yesterday and last night the OH took me to the cinema in Barnsley (Monday is £5 night) to see the new Avengers film, but again that made for a long day, so today I gave up and stayed in bed. Anyway, to continue from the story I wrote last week about William Malkin, the Barnsley man who left his wife behind when he emigrated to Australia. Frances Mary Malkin had contacted the Australian military authorities in August 1916 claiming to be William's next of kin, but she did not show her 'marriage lines' as proof. It is so easy for us today, a quick search on FreeBMD shows that William Malkin married Frances Mary Bailey in the June Quarter of 1902. Even more handily the new Yorkshire Marriages on Find My Past include marriages for Worsborough (presumably St Mary's Worsborough) from 1742 to 1912 and I was able to find an image of the actual marriage entry for William and Frances' marriage. What was surprising when I found this was the age and class difference between William and Frances. He is the 18 year old Labourer son of a Miner and she is the 30 year old daughter of a Draper - which suggests a solid upper working class, if not middle class background to me. Now knowing that I needed to look in the Worsborough parish records, which are not on Ancestry, I searched various spreadsheets that I have collected over the years and found a entry for the baptism of William and Frances's only child - Clifton Trevor Malkin - at St Thomas' Church in Worsbro' Dale in December 1903. This child, listed simply as Trevor Malkin, aged 7, is living with William Malkin snr, his grandfather, in Ward Green in the 1911 census. So William jnr and Frances may have parted company, but her in-laws were helping Frances by providing care for her son. Clifton Trevor Malkin appears in the Australian service records, confusingly referred to as William's stepson, when Frances is granted a pension after William's death. I looked back in the census, helped by now knowing Frances' age and father's name. She appears in the 1911 census, boarding with a family called Wraith on Pontefract Road, Barnsley, her occupation is given as Health Visitor for Barnsley Council and she says she was born in Toxteth Park, Liverpool. With her birthplace too, I sure I have found the right family in the earlier census returns. I can find neither William nor Frances in 1901, but in 1891 she appears with her family, living in Hoole in Chester. Father Benjamin Bailey is a Draper and was born in Barnsley, Yorkshire (well, there's a good link) in around 1842, his wife Mary is from Bath. They have two children born in Liverpool, including Frances Mary and the others are born in Chester. Ten years previously the family was already in Chester, but ten years before that, in 1871, Benjamin Bailey, a married man was lodging in Toxteth Park, Liverpool and states that he was born in Mapplewell. His wife is not with him, and I can't positively identify her elsewhere, but FreeBMD shows Benjamin Bailey marrying Mary Williams in Liverpool in the September Quarter of 1870. Frances' baptism in St Peter's Liverpool (also found on Ancestry) gives her date of birth 25 May 1871 so maybe her mother was staying with friends in her late pregnancy while Benjamin was working and has not been enumerated correctly. The next thing that was easy to find for Frances was her remarriage in November 1916 to Joseph Henry Jeffs at St Mary's Church in Barnsley in the West Yorkshire records on Ancestry. Joseph Jeffs was a Police Constable and was also twelve years the junior of Frances Mary - who does not give any occupation on the marriage entry. She now says her father is deceased and that he was a Silk Mercer and Linen Draper. We still don't know how she got from Hoole in Chester to Barnsley, but neither of her marriages appear to have members of her family standing as witnesses. I did notice - as it was so unusual - that she gives her occupation as Health Visitor in 1911. So on my next visit to Barnsley Archives I searched the Barnsley Chronicle for mentions of Malkin particularly looking for Frances Malkin or F M Malkin or even Frances Jeffs. The digital version of the Chronicle can be searched by name, but only one month at a time, so it does take ages to look through just a few years. However I was very lucky as in 1918 I found a piece that gave me dates to work to and lots of other information. The article is about the resignation of Mrs Frances M Jeffs of Caxton Street, tallying only the name but also in the address to the information given on William Malkin's Commonwealth War Graves Commission entry. 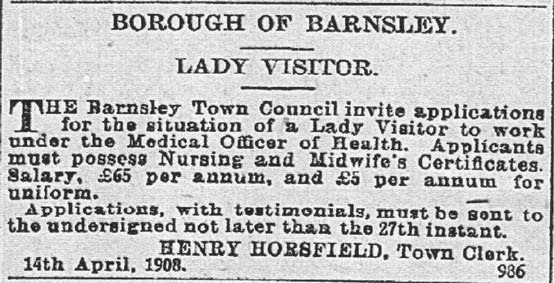 It seems Frances had worked for Barnsley Council for ten years as a health visitor and supervising midwife and that she had been the first health visitor to be appointed in the borough. This gave me a suggested date for her taking the post in Barnsley around 1908. More on that in a moment ... The helpful article also tells us that she trained at Shrewsbury Infirmary and later worked in Staffordshire - maybe that was where she was in 1901? She held a certificate of the Central Midwives' Board - a bit of Googling showed that midwives only started to be certified in 1902. It seemed likely that the appointment of a Health Visitor would have been important in Barnsley, so I searched the Council Minutes for 1908 (which are typed up summaries of all the various Council Committees bound into one volume per year). The Sanitary Committee decided in March 1908 to appoint a Lady Visitor "in consequence of the great infant mortality in the Borough". Cross checking against the Chronicle again I found a report from the Sanitary Committee which stated that the general death rate in the Borough was 18.46 per thousand compared to an average in England and Wales of 15 per thousand, and that the high death rate in Barnsley, "was principally due to the excessive infantile mortality, which worked out at 155 per thousand". (Barnsley Chronicle 11 April 1908) One of the councillors had also commented that it was not altogether improper feeding that was to blame, but, "in many cases it was want of any feeding at all", and that he hoped a Lady Visitor would be able to assist in getting help for cases like this from charities which he considered more important than teaching the mothers how to feed the children. What an assessment of the state of affairs in Barnsley at the time! This is the advertisement in the following week's edition of the Barnsley Chronicle for the post of Lady Visitor. Applicants need to have Nursing and Midwife's Certificates and would be paid £65 per year with an extra £5 for uniform. The Sanitary Committee minutes for April note that, "Mrs Malkin, of Ward Green" was to be appointed. This means that Frances Mary Malkin must have obtained her nursing and midwives qualifications before 1908, and her midwife's certificate between 1902 and 1908, as we know there was no certification before that. It seems very unlikely that she continued to work as a nurse after her marriage to William, most women had to resign their positions when they chose to marry in those unenlightened times. Had she used her nursing skills to work as a midwife after her marriage to supplement the family income? Even if she did not have her certificate to start with it was legal to practice under the supervision of a doctor. Maybe she took the exams later? There are midwives' records at TNA but none are available online. I did find an index entry for Frances Mary Jeffs in the 1920 Midwives Roll on Family Relatives.com, but I would have had to have bought an expensive subscription to see the image. I can see parallels with my own story in Frances' life. I did not do well in my exams at school, but later in life, when my first husband was unable to find work on a regular basis, I began to train as a Radiographer in Sheffield. My then husband did not like being a house husband, so he went back to work whenever he could, his mother looking after our two little children for us. After the first year of my training he became so aggrieved that he asked me to give it all up and to come home to be a full time wife and mother again. I refused to waste the time and effort that I'd put in up to that point seeing the chance of a professional career as a good way to better myself and provide for my children so consequently our marriage broke down. Did Frances, a trained nurse, regret her possibly hasty marriage to the much younger William, a Coal Miner with few prospects? Did Frances obtaining a good job as 'Lady Visitor' finally break down their marriage to the extent that William emigrated to Australia to seek his fortune the following year? - if his mother's estimate of when he left is correct (see my previous post). Frances obviously lived in Ward Green, with or near the older Malkin family in 1908 when she got the job. But William's last address in Barnsley is given in his 1916 Chronicle obituary as Grove Street - which is near Barnsley football ground and about a mile and a half from Ward Green. It is, however, just off Pontefract Road, which is where Frances was living in 1911. If only there were more records of where people lived! Frances Malkin resigns her post in September 1916, but is obviously re-employed after her marriage to Joseph Jeffs as the item I found first mentions her (second) resignation in early May 1918. This is probably because she and Joseph are about to have a child themselves, as Joseph Cunningham Jeffs is born on 8 May 1918, according to his father's war time service records. Joseph snr attests in 1915, but is not mobilised until June 1917 when he is posted to the Royal Garrison Artillery. Unhappily Joseph Henry Jeffs returns from the First World War with a good character, but is discharged in November 1918 with 'Mania' caused by his service. Whatever this entails it affects him very badly as he is granted a pension for 26 weeks due to his 50% disability. I hope that Frances was working again by then as the 13 shillings and 9d per week he was awarded wouldn't have gone far to support himself and a wife and child. His name appears on the Barnsley Borough Police Roll of Honour where it is noted that he was Wounded in Action - as I can see no mention of wounds in his service record this is probably a reference to the damage to his mental health. I hope that he recovered and returned to his job in the police force. Frances Mary Jeffs dies in Barnsley in 1946 aged 75 years. Joseph Henry Jeffs dies in Barnsley in 1953 aged 62. I do not know where they are buried. Clifton Trevor Malkin marries and has two children. Joseph Cunningham Jeffs marries and has two children. These children will more than likely still be alive today. I imagine Frances to have been a hard working, well respected member of the community. She managed a job and a family over 100 years ago. She twice married a much younger man, her second husband was possibly disabled for some time after the war, but with the help of an extended family successfully brought up two children. What an example to us today! I would love to know more about the life and career of Frances Mary Bailey - Malkin - Jeffs, Barnsley's First Health Visitor. I have found Mary Bailey at Ward Green Farm as a Nurse (1901 census) the cross reference being that she was born in Toxteth Park Liverpool. Thank you for this Rob. She, and I agree with you that this must be her, is on the very next page of the census to William Malkin. I hadn't though of looking for her under her middle name, and Ancestry has mangled the transcription of her birthplace! I assume she has been employed to care for the elderly lady who heads the household at Ward Green Farm? Reading back my post I see I said I couldn't find either William or Frances in 1901, but I mentioned in the previous post that I had found him in Ward Green as a Pony Driver in the pit - my only excuse is that I say I was really tired the day I wrote this post! Sorry about that and thanks for reading my post and getting in touch. I understand the mist that occours when you end up staring at hints and badly transcribed records (all depending on the fatigue factor of the transcriber). I think that I have her grandmother as Mary Goldthorp (B: Darton) And she has been helpful by adding her maiden name to some of her offspring (a habit that helps the family historian). Thanks for this pointer. I won't be researching Frances Mary in any depth for a while as I have so much on with the Barnsley War Memorials Project, but your comment has been filed!